Totally, among 2826 Wikipedia citations, 1915 dental articles were cited from 91 dental journals. 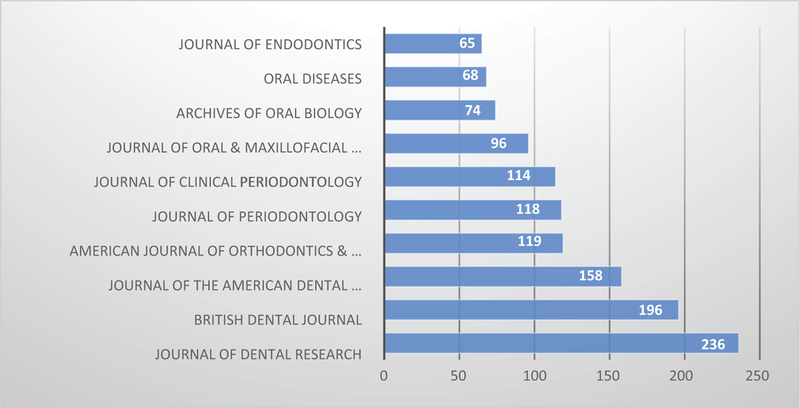 The Journal of Dental Research had the highest number of Wikipedia citations followed by British Dental Journal and Journal of the American Dental Association [Figure 1]. 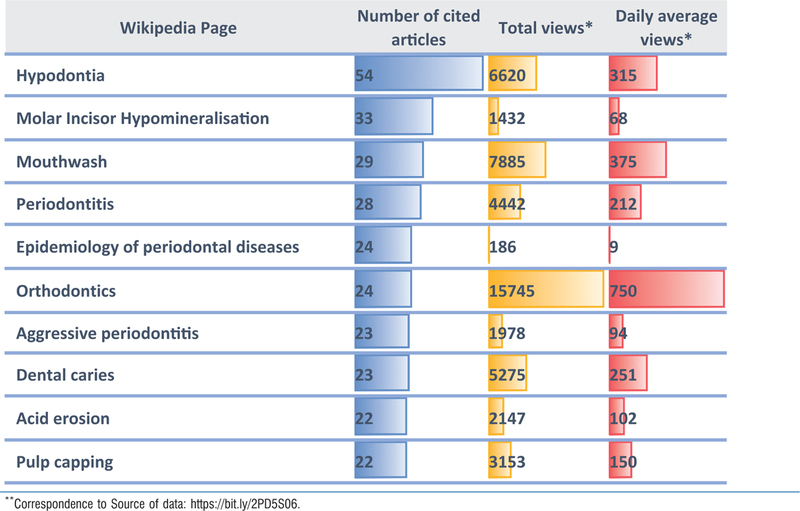 Among Wikipedia articles, “Hypodontia” cited the greatest number of dental articles, followed by “Molar Incisor Hypomineralisation” and “Mouthwash” [Table 1]. Meta-analysis and systematic reviews are the most popular topics among Wikipedia citations. Considering the principles of evidence-based dentistry is so promising. The use of high-level evidences from well-known academic journals showed that dental Wikipedians and editors were scholars who were familiar with the principles of literature review. In contrast, highly cited dental articles had the lowest level of evidence. 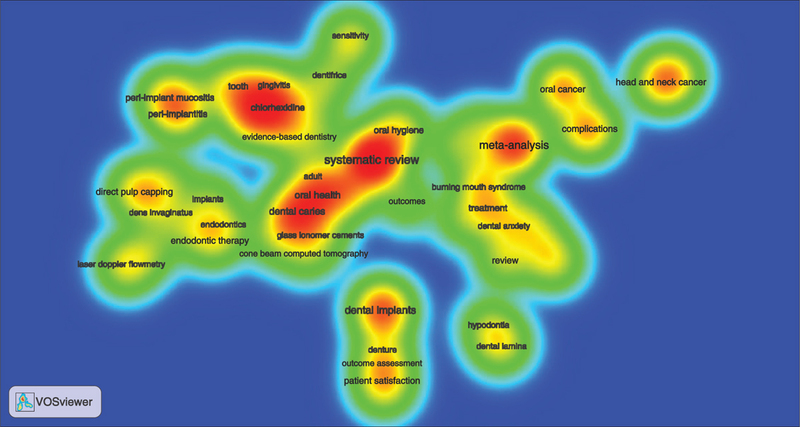 In addition, dental implant, dental caries, and oral health were other hot topics [Figure 2]. Giles J. Internet encyclopaedias go head to head. Nature 2005;438:900-1. Mesgari M, Okoli C, Mehdi M, Nielsen FÅ, Lanamäki A. “The sum of all human knowledge”: A systematic review of scholarly research on the content of Wikipedia. J Assoc Inf Sci Technol 2015;66:219-45. Murray H. More than 2 billion pairs of eyeballs: Why aren’t you sharing medical knowledge on Wikipedia? BMJ Evid Based Med 2018. doi: 10.1136/bmjebm-2018-111040. Cheng F-F, Huang Y-W, Yu H-C, Wu C-S. Mapping knowledge structure by keyword co-occurrence and social network analysis. Libr Hi Tech 2018;36:636-50. Chen X, Chen J, Wu D, Xie Y, Li J. Mapping the research trends by co-word analysis based on keywords from funded project. Procedia Comput Sci 2016;91:547-55. Kolahi J, Soltani P. Scientific landscape of dental literature in 2017. Dent Hypotheses 2018;9:29-30.
van Eck NJ, Waltman L. Software survey: VOSviewer, a computer program for bibliometric mapping. Scientometrics 2010;84:523-38. Kolahi J. The lowest epistemologic strength and the highest citation rate: An opinion. Dent Med Res 2016;4:29-30. Shafee T, Mietchen D, Su AI. Academics can help shape Wikipedia. Science 2017;357:557-8. James R. WikiProject Medicine: Creating credibility in consumer health. J Hosp Librariansh 2016;16:344-51.